Most people who visit Madera Canyon in southeast Arizona take only short walks, along the level paths beside Madera Creek, or the only slightly more strenuous Nature Trail (1.8 miles) further upstream; the most exciting trails, which climb 2,000 feet or more up the side of Mount Wrightson to the south are not so much used, and generally require a full day trip. For a shorter, half-day hike, still quite testing, perhaps the best choice is a 5.8 mile circuit across part of the eastern slopes of the canyon, visiting three springs (Bog, Kent and Sylvester), the latter two in a large side drainage that contains a flowing stream which forms a number of pools and cascades, some slightly away from the path. The hike, which gains 1,750 feet, is sometimes known as the Three Springs Trail, and typically takes between 2.5 and 4 hours. 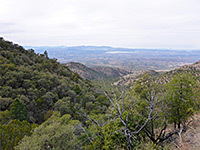 Views along the loop are generally limited as most is through thick woodland and along the floors of ravines, though some parts cross more open slopes, allowing a good panorama up and down the main canyon, and northeast towards Green Valley. Since most of the surroundings are shady, partly riparian, and far from the busy corridor along the road, there is a good chance of spotting some of the many animals and birds for which this area is renowned. Wildflowers are somewhat limited owing to the predominantly shady conditions, and are more numerous in summer rather than spring. 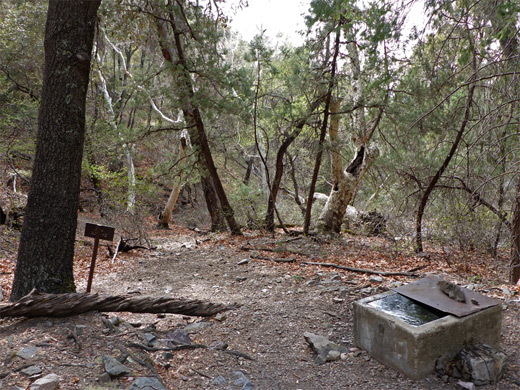 The Bog, Kent and Sylvester Springs loop can begin at the Bog Springs Campground, but only for campers, as there is no additional parking available for day visitors; instead, the usual start point is at the Madera trailhead/picnic area, along the main road just south of the camp turn-off. The distance from here is just 0.2 miles more. The first part of the path is quite narrow, and has patches of loose stones, as it rises through a wooded area and soon comes close to the boulder-filled creekbed that leads from the first of the springs (Bog); a usually dry channel at this point. The gradient lessens as the path curves south, past the connection from the campground and on to a second junction in grassier surroundings, with a path on the left to Dutch John Spring, 1.3 miles away. The other route climbs again, through light woodland again, up to the next junction, 0.9 miles from the start, at the beginning of the 3 mile loop section of the hike, which is usually completed in the clockwise direction, and so turning left at the intersection. 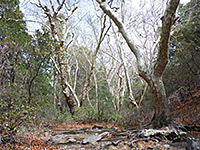 This path is signed to Bog Springs; it ascends, via a series of short steep parts between more level stretches, then traverses the hillside towards the target drainage, near which the trees grow gradually denser and taller. 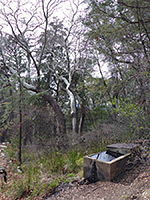 A very short spur descends to Bog Springs on the canyon floor, where the most obvious feature is a concrete tank filled with water, as the actual springs are indistinct, and a little further up the ravine, surrounded by a group of barkless, fire-damaged trees. The continuation trail, quite narrow, diverts around a little gully, briefly returns to the side of the canyon above Bog Springs, then heads south, emerging from the tall trees onto bushy slopes, with fine views of Madera Canyon. More climbing, steeper than before, takes the path across a rounded ridge and towards the next, larger drainage, containing the other two springs. The path flattens out and again the vegetation gradually increases, first with a band of oak trees and then tall pines, as the creek bed approaches, this usually containing a shallow stream, forming little pools and cascades. Kent Spring is on the opposite side of the valley, also marked with a tank. 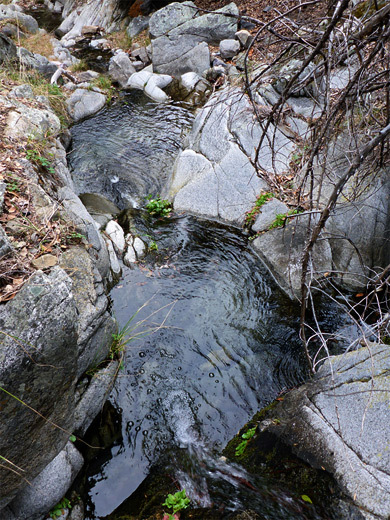 A junction here is with a lesser-used path, the Four Springs Trail, which climbs further up the valley to another spring (Armour), and then Florida Saddle, at the head of nearby Florida Canyon. From Kent Spring the loop path follows the south side of the creek, descending very steeply, and is straight, without any switchbacks, covered by more patches of loose stones in some places. It crosses to the north, following a black pipe part of the way, and comes back to the south at Sylvester Spring, which has another tank, below a big clump of reeds. Not far below, just after the path veers south to enter an adjacent drainage, is a nice sequence of waterfalls and pools, between smooth chutes of water-polished granite. The adjacent, larger drainage leads back towards the junction at the start of the loop; the path is on the south side initially, within sight of many big boulders and piles of flood debris along the creekbed, then crosses for the last time, at a point where the waters have usually sunk below ground, and finally runs through more open woodland with a floor of coarse brown sand, back to the junction, from where the Madera trailhead is 0.9 miles further.